When the weather gets cold and frosty, everyone needs warm winter socks to keep their feet warm, so check out this amazing range of low-cost women’s wholesale sweater socks, thermal socks, and boot socks that we have on offer for you here. 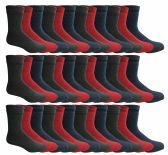 This selection of inexpensive wholesale women’s thermal socks would be ideal for camping, hiking and for those who work outdoors. They would also be great for bulk purchases of inexpensive, sweater, and boot socks for giving to the poor and for charities like the Salvation Army and the American Red Cross. 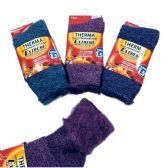 Whether you are a retail store, or a not-for-profit organization looking for cheap warm winter socks for the homeless and the needy, we offer the biggest bulk wholesale discounts on our entire range of women’s boot socks, thermal socks and sweater socks. We have massive bulk discounts on Marino Wool boot socks, the lowest wholesale prices on inexpensive fashion thermal socks, and some incredible deals on warm winter socks for school. From women's thermal tube socks to thermal winter warm socks for hiking, the biggest wholesale deals on winter socks for women are all to be had here at Wholesale Sock Deals. 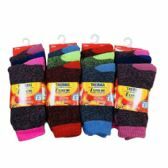 Wholesale Sock Deals are the number one wholesale supplier of inexpensive women’s socks and clothing essentials to both the retail trade and to the charity sector. So, place your bulk order for women’s winter warm socks today, and get the best quality women’s thermal, sweater and boot socks and the cheapest bulk deals on wholesale women’s winter socks for your retail store or charity. Don’t get cold feet! Order your bulk cases of wholesale women’s thermal socks, sweater socks, and boot socks and get the biggest wholesale discounts on women’s socks that you will find anywhere. 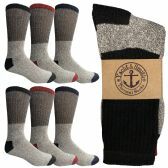 Warm winter socks for women are always going to be in high demand in a women’s apparel store, discount store or ladies fashion boutique, and they are essential clothing items for the poor and homeless for charities like the Salvation Army and the American Red Cross, so stock up now with cheap wholesale Marino wool thermal socks, rugged and hardwearing camping and hiking boot socks, and warm cold-weather socks for women. 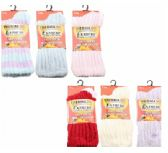 Women’s steel toe heavy duty thick boot socks, unisex trail hiking socks, ladies’ thick thermal socks or women’s sweater super fuzzy socks; you are guaranteed to get the best wholesale deals on all your bulk purchases of inexpensive ladies’ winter socks at Wholesale Sock Deals. Whether you are a charity or retail outlet, we deliver all our cases of low-cost women’s socks, women’s fashion items and women’s clothing essentials, free of charge. It’s all part of our commitment to providing an A1 service and top-quality products at low wholesale prices. 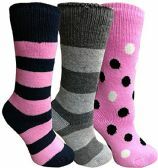 Women’s Fashion thermal socks, or basic winter socks for women, Wholesale Sock Deals will always offer you the biggest bulk discounts on women’s winter socks and on all your wholesale clothing items. Don’t miss out on this opportunity to purchase the best quality women’s boot, sweater, and thermal socks at the lowest wholesale prices. Order your low-cost women’s winter socks now and grab a wholesale bargain for your store or charity today!